The posters and banners said ‘Expect the unexpected’ and they were certainly right. The NOW Northwich arts festival took over the town centre last weekend (Saturday 6 October) attracting an estimated 26,000 people. 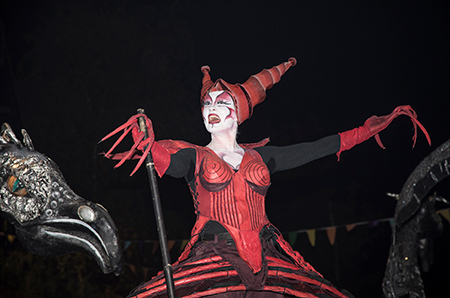 The festival featured over a 100 local performers led by Cheshire Dance and Fallen Angels Dance Theatre alongside nationally recognised UK artists. Soaring above the heads of spectators, Highly Sprung brought a unique Urban Astronaut performance highlighting the issues of environmental damage to the planet. 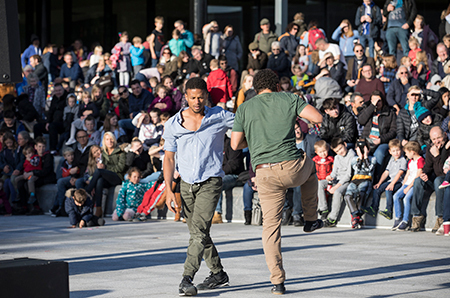 There were dance performances by Company Chameleon, Cheshire Dance, Fallen Angels Dance Theatre and other local dance groups using locations around Barons Quay and Witton Street. Councillor Louise Gittins, Cabinet Member Communities and Wellbeing, said: “Many congratulations to all involved, performers, crew, organisers and especially the welcoming audiences for each performance. Dutch performers Close Acts stunned the crowds with their stilt walking prehistoric beasts. The early evening performance turned Witton Street into an exciting environment filled with red lighting and smoke as the performers weaved their way through the crowds. Northwich BID Manager Jane Hough said: “Northwich truly came alive and it was amazing to see the town so busy and to also see so many smiling faces. 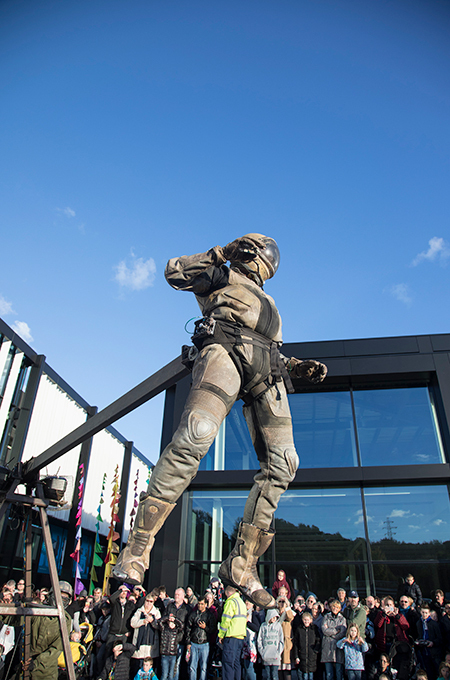 “The Northwich Business Improvement District was delighted to be involved in the organisation, planning and marketing of the event and we are pleased to report that there was a massive uplift in footfall on the day. David Morgan, Programme Manager, Without Walls Consortium said: “I was really delighted by the fantastic turnout for the first NOW Northwich event on Saturday. The level of enthusiasm was amazing, and it proves that there's a real appetite for this kind of work locally. This event has real potential to grow and establish itself as a major fixture in Cheshire's cultural calendar." Social media was on overdrive, with comments including: “What a great day”, “Amazing acts”, “What a fabulous event”, “Wow the closing parade was epic” and “Busiest I’ve ever seen the town centre”. Now Northwich was funded by Cheshire West and Chester Council, Arts Council England, Northwich and Gadbrook Park BID’s, Marketing Cheshire and the SLANT programme. The aim is to develop an annual event for the people of Northwich and surrounding areas; showcasing the best local, national and international street artists.